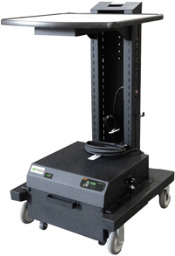 Portable Power: Experience True Mobility with a Power Swap System - 24 HOURS PER DAY! 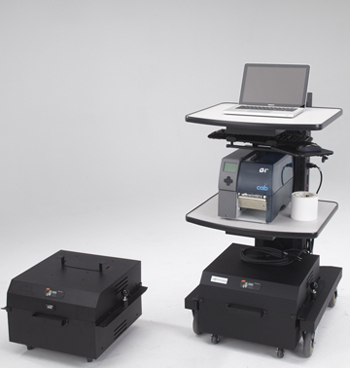 The NEW Power Swap System enables the NB Series Mobile Workstation to power your printers, computers, scales, testers and other hardware 24 HOURS PER DAY. It's ideal for facilities with multiple work shifts. When the NB Series battery power is running low, simply swap out its power system with a fully charged one. The swap takes about 30 seconds to complete, allowing the NB Series Mobile Workstation to be used during multiple shifts with minimal interruption. See for yourself how the swap is completed in about 30 seconds. Watch our video below. Complete system shown above with optional middle shelf and keyboard tray. NB430PS - Power Swap System with 100 AH Battery: Includes (1) NB430 Mobile Workstation with PS01 installed and (1) PS22. International version is also available. NB440PS - Power Swap System with 200 AH Battery: Includes (1) NB440 Mobile Workstation with PS01 installed and (1) PS25. International version is also available. Overall Weight: 318 lbs. 468 lbs. PS22 - Additional Power Swap Standard Power Package with 100 AH Battery: Includes 16" x 16" x 12" ventilated cabinet, cabinet handle, power cord reel holder, swivel casters, digital meter with color coded LED display that provides battery status & audible low voltage alert, and integrated power system. Weight: 120 lbs. International version is also available. PS25 - Additional Power Swap Standard Power Package with 200 AH Battery: Includes 16" x 16" x 12" ventilated cabinet, cabinet handle, power cord reel holder, swivel casters, digital meter with color coded LED display that provides battery status & audible low voltage alert, and integrated power system. Weight: 195 lbs. International version is also available. Contact us for more information or call 781-935-3450. Eliminate the need to purchase additional workstations and hardware. One NB Series Workstation can now do the work of 2-3 units when it's integrated with the power swap system. Simply plug power swap unit into standard power outlet for battery recharge.